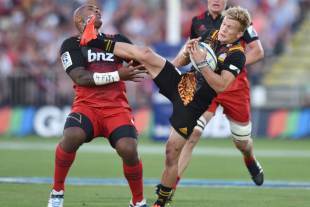 The Chiefs scored four tries, one of them to fullback Damian McKenzie, who produced a lively display. McKenzie also created a try, banged over a long-range penalty to get the visitors on the board and pulled off a try-saving tackle on big winger Nemani Nadolo. The Chiefs defeated the Crusaders in a game that swung one way and the other in the second half before the visitors iced the victory with a try by Sam Cane from a set lineout move three minutes from full-time. Rookie five-eighth Richie Mo'unga gave the Crusaders the lead early in their first Super Rugby match of the post-Richie McCaw and Dan Carter era, before his experienced counterpart, Aaron Cruden made a searing break from which the Chiefs scored their first points through a penalty from Damian McKenzie. Cruden looked hungry in his first competitive outing since last April, when he suffered a knee injury, also against the Crusaders at AMI Stadium, and he was also involved in an early push-and-shove with Andy Ellis that had others rushing in. No sooner had McKenzie got the Chiefs on the board than he turned creator with a deep cross-kick. David Havili fielded the kick but young winger Shaun Stevenson stripped him of the ball and marked his debut with a try, although his night turned sour when he went off early in the second spell with a shoulder injury. The Crusaders went back in front in dominant fashion just before half-time, when their pack produced a huge eight-man shove on a defensive Chiefs scrum to win the ball and send Mo'unga over. Seta Tamanivalu touched down to put the Chiefs back in front early in the second spell, but the lead swapped hands again almost immediately when Havili scored after the Crusaders forwards had produced a big lineout drive. McKenzie scored the Chiefs' third try and edged them back ahead with the conversion with 13 minutes to go, and then Cane scored before the Chiefs staved off one final attack by the Crusaders.